I decided to roughly test my Ruckus camping setup overnight last Friday. Picked up a Subway foot long to save on having to make dinner. Looked over and noticed Sugarloaf Mountain basking in the golden hour rays of the sun. The fading rays of the sun had already passed over the Potomac River as I reached the end of the road. The verdrant vegetation only has another month or less until it brightens up for the fall colors. 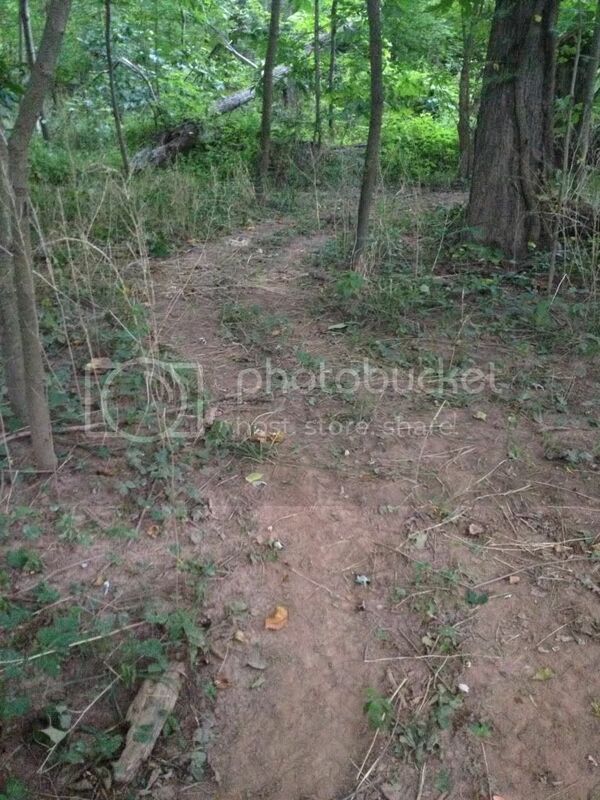 I found an ATV path just beside the train tracks and explored it until it dead ended at a creek. This seems like a good place to hang my head for the night! I crack open a Guiness, string up my hammock and kick back for a nice relaxing evening beside the babbling creek when I hear the distinct rattle of a dirt bike exhaust. Crap. It grows closer and closer. 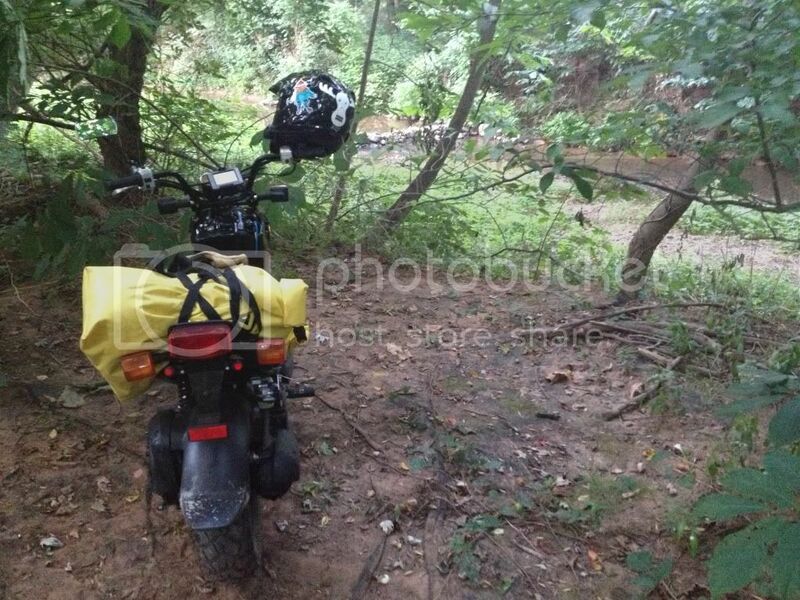 I pack up the hammock quickly, hide my beer and act like nothing is out of the ordinary...just hanging out on my 50cc scooter down an ATV trail in the woods in MD. The usual. This 14 year old kid comes tearing through the woods on a mini sized ATV and stops just as he gets to me. His eyes were wide and I could tell he was wishing it had a reverse gear. I waved and said "Howdy!". Somewhat disarming him, I go to shake his hand, and he limply shakes mine and introduces himself as Josh. He lived in the house I passed up the gravel road. He waved back when I cruised past an hour earlier. We chatted about how him and his pop built this four wheeler out of a 125cc dirtbike engine and how much fun it is for its size because of the clutch and small tires. I moved the ruckus and he drove it into the creek to show off. 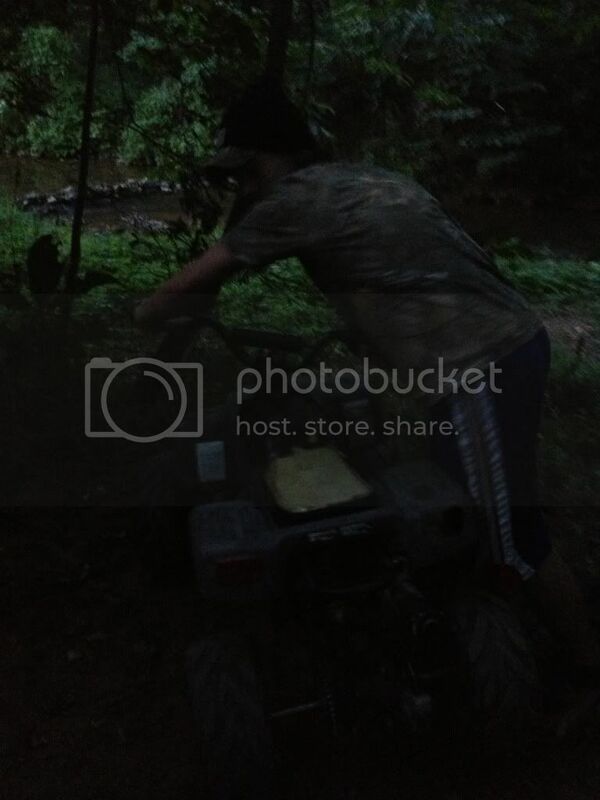 It grew dark, he grew tired of riding around the creek and I helped push him out. He invited me to go night fishing but I told him I'd pass. Had a long day. Off he went and out came the hammock again. The frogs chirped their distinct song of summer as I hung in the hammock listening to the creek. Every 30 min or so the MARC Brunswick line rolled past and later in the night, a couple CSX freight trains. The morning silence wasn't broken too harshly when I started up the little 50cc Ruckus. Up and running, she blasted off into the cool morning air at a respectable 30mph. We're off like a herd of turtles! The sunrise over Sugarloaf Mountain was beautiful as the mist hung in the bean fields. I had some coffee and a fast food bfast sandwich and headed back down the road onward to home. I may not be that far from home but getting out into the country in the morning feels so right. The smells, the sights, everything stirring and waking up. I took a side tour down to Seneca Creek where I saw the old C&O Canal Aqueduct. Maryland is very active with cyclists on the weekends. This was outside Potomac. They really ride the roads out here with a vengeance. Believe me...he was moving fast. Stats for the trip! (My lowest everything ever) It ain't about the miles, sometimes it is about the smiles. Oh yeah I went back on a similar route in the afternoon with Dr. Beard on the GS's and snagged the Goose sign I missed. WE saw this nice 308 outside Boulangerie in Potomac. Then I let him go ahead on River Rd. White's Ferry Rd and the lovely grove of trees. Caught up to this stranger on 66. After getting home, I loaded my inflatable kayak on the Ruckus and went down to the water for a maiden voyage. The wind picked up making it interesting in my inflatable boat. I took a short break paddling back. Enchiladas were at 7PM and it was nearing 6:30. Time to get home and grab some beer on the way! It was a full Saturday!